Has it always been your dream to go on vacation with your BFF and be treated like celebrities? Now's your chance! E! Channel will be giving away an all-expenses paid trip for you and your BFF to Los Angeles! Not only that, you'll also get to see the Primetime Emmy Awards live AND in style with a wardrobe provided by none other than Rajo Laurel himself! 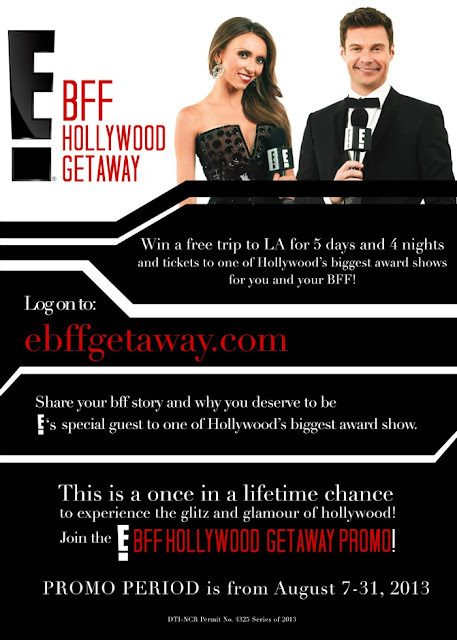 To join, all you have to do is log on to http://ebffgetaway.com/ and upload a photo of yourself and your BFF, share your BFF story and why you deserve to be E! 's special guest at the Emmy's. Deadline of submission of entries is on August 31,2013 at 11:59. See poster below for more info.